The book drive has concluded. We’re counting your donations and are well on our way to our goal of 20,000 books! The Children's Book Harvest is an annual community-wide book drive that takes place each fall to help The Children's Book Bank gather and provide books to thousands of children in our community who might not otherwise have books of their own at home. During the months of September, October, and November, schools, businesses, congregations, and other organizations help build our book supply by organizing local book drives, making it easy for families to pass along the books their children have outgrown. Picture books are thoughtfully bundled into mini-collections to help Head Start families build regular reading habits. Books for school-age children are sorted by grade level and distributed each spring to high needs schools who then hold free books fairs, where the entire student population chooses a small collection of diverse, engaging books to help combat the summer slide. Thousands of books also find their way into homes of families desperately in need of them via food pantries, community health care clinics, and youth camps. Financial donations help purchase new culturally relevant and home-language books, ensuring that every child we serve has the affirming and validating experience of seeing themselves reflected in the books they read. The Children's Book Harvest book drive seeks books appropriate for babies, toddlers, and early elementary students through grade three. Both gently used books in good condition and new books are welcome. The Children’s Book Bank is not able to find homes for discarded reading program or school library books. 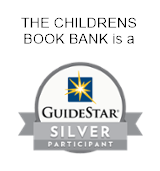 We strive to provide books to families that are of current interest and of gift-like quality. Culturally relevant and Spanish language books are greatly needed. Here is a list of some of our favorites. Financial donations help purchase new culturally relevant and home-language books, ensuring that every child we serve has the affirming and validating experience of seeing themselves reflected in the books they read. Supporters who wish to contribute financially may donate here. Organize a book drive in your school, business, congregation, or organization! Please contact us at info@childrensbookbank.org for more information or to join our mailing list. For information about hosting a book drive outside the Children's Book Harvest, please contact info@childrensbookbank.org. The Children's Book Bank provides book drive guidelines and tips, posters, box labels, donation receipts, and suggestions for newsletter and social media publicity to help you host a successful book drive. School book drive organizers find that limiting the duration to two or three weeks, providing a donation box at the school Scholastic Book Fair, coordinating the drive with Battle of the Books, and encouraging families to bring books to student conferences are all helpful in maximizing donations. Some schools organize upper grade students to lead the book drive and visit classrooms to promote the book drive to other students. Others place donation boxes in each classroom to increase visibility. Participating Children's Book Harvest schools receive special boxes for their donations before their drive begins. Schools can use these boxes as collection boxes during the book drive and to pack donated books in for delivery to The Children's Book Bank. After the Children's Book Harvest concludes, coordinators sign up to arrange a book donation drop off time at The Children's Book Bank. Video: Which books are most needed, physical condition of donated books, and how to sort and pack donated books into collection boxes for delivery. Collecting books is just the first step! Every donated book gets lovingly restored by volunteers who examine every page, erase scribbles, tape torn pages, and wipe covers. 1,500 hours of volunteer time goes into preparing 30,000 books for their new homes! Is your workplace, civic group, church, or book club looking for a fun volunteer opportunity with immediate impact? Contact The Children's Book Bank info@childrensbookbank.org to arrange a book cleaning event or register at Hands On Greater Portland for one of our volunteer sessions. Many thanks to our CBH school book drive coordinators!